Chamber Music Northwest commemorated the era Friday night at Kaul Auditorium with a brilliant program meant to evoke the world of 1911-15, part of both this year's Reediana Omnibus Musica Philosopha (ROMP!) and the college's rolling centennial celebration. It was only right that CMNW get in on the festivities: the organization first moved its summer festival to the old Reed commons 40 years ago, beginning a relationship that has helped since 1998 to anchor Kaul as a major Portland performance venue. The biggest and most influential work on the program was Arnold Schoenberg's Pierrot Lunaire, which cellist Fred Sherry declared beforehand was "the piece that opened the door to the 20th century," echoing Igor Stravinsky's opinion of it as "the solar plexus as well as the mind of 20th-century music." Written in 1912, the piece comprises 21 settings of poems (in Otto Erich Hartleben's German translation) drawn from the collection of the same name by Belgian symbolist Albert Giraud. The text involves the clown Pierrot, a stock character of French pantomime, by turns lovestruck, blasphemous, mocking, violent, and finally nostalgic. The poems' imagery is strikingly strange, with "black gigantic butterflies," a bloodied communion wafer, Pierrot smoking through a trepanned skull, and Schoenberg's instrumental writing captures their nocturnal brightness as well as their sense of the macabre. The moon hangs over it all (hence "Lunaire"), including a verse in which Pierrot "bedizens his face in a high noble style with a fantastical moonbeam." The image accurately describes the look of soprano Mary Nessinger, who gave a fantastic performance. Her whitened and magnificently expressive face had either the pale color of moonlight or the ashen look of a corpse--take your pick, since the texts are suffused with deathly imagery as well. With eyes made up to look sunken, she had a zombie aura equally appropriate to the music. Schoenberg had taken leave of traditional tonality years earlier but still, in Pierrot, used traditional structures such as rondo, passacaglia and fugue; without the tonal soul that previously animated them, the old forms become haunting, grotesque, and undead. Most arresting, Schoenberg set the vocal line in Sprechstimme, or "speaking-voice," a hybrid of speech and singing adapted from the melodramatic tradition. Nessinger murmured, shrieked, wailed and intoned, her spine-tingling vocalizations accentuated by precise gestures--a twitch of a shoulder, a cocked head, a sneer. Neither Yoko Ono nor Diamanda Galas have ever been more viscerally affecting. 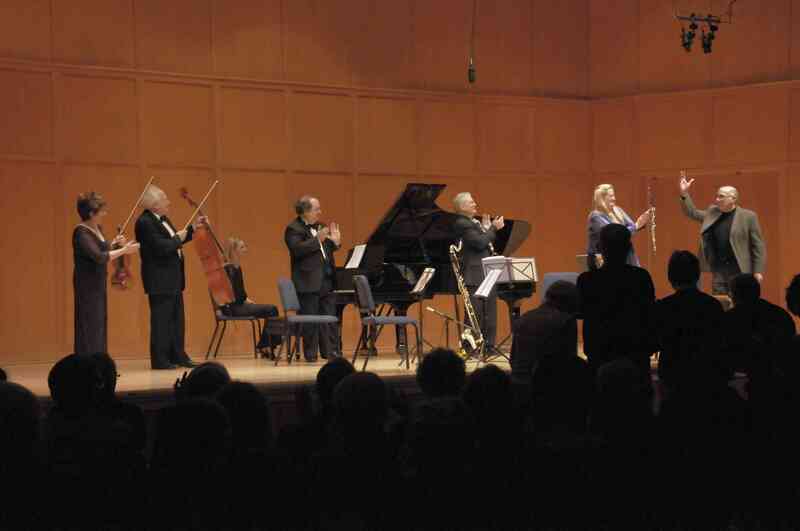 Along with rock-solid playing from her partners--cellist Sherry, pianist Jeffrey Swann, violinist/violist Ida Kavafian, clarinetist David Shifrin, and flutist Tara Helen O'Connor--she demonstrated that even after a century, the piece has not lost its capacity to unsettle (or to drive listeners from the concert hall; there were at least a half-dozen hasty departures). Before intermission was Maurice Ravel's 1914 Trio for Piano, Violin, and Cello, which exemplified not the 20th century but rather the end of the long 19th: East Asian influence, in its use of a Malaysian poetic form, the pantoum, in the second movement; gestures to the pre-Classical period, in the third-movement Passacaille (part of which, in muted straight tones, recalled the sound of viols); as well as the inclusion of ethnic music, in its use of material reflecting Ravel's Basque heritage. Virtuosic and encompassing virtually the entire range of all three instruments, it is more vast and wide-ranging than most of Ravel's works for larger forces. As in the Schoenberg, the performance was a thrill: Swann was masterful in explosive passages with fast notes strewn all over, and Kavafian and Sherry were exemplars of keen ensemble. Their tone was gorgeous and their intonation sterling, which was crucial to bring out the music's myriad fine details. The evening began with the premiere of "Class of 1915," mostly arrangements of popular dances of the time, by professor David Schiff [music 1980-], a frequent collaborator with CMNW. The first movement combined five foxtrots by African-American composers including Luckyeth Roberts and Will Vodery, mentors to the young Duke Ellington; the third was a rip-roaring rendition of James Reese's "Castle House Rag." Between them was a sultry, striding homage to W.C. Handy's "St. Louis Blues," with quotes from the original and a soulful spotlight for Shifrin's bass clarinet. The instrumentation was the same as in the Schoenberg, lending both brightness and cohesion to the evening; the rhythms swung, giving a hint of what the first Reedies might have danced to when they got a break from the books.